The HarpGear HG35 is the updated version of the HG30. It now is a 2x10" amp based on the same circuit as the HG30 with 5 more watts of power for a total of 35W. The HarpGear 35 is HarpGear's next step in building a mid sized amp which achieves 35W using a cathode bias 6L6 setup. This amp is setup specifically for harmonica and uses all of our standard harp amp modifications we have become known for. This amp was designed to add flexibility to our amp line and allow you to play in more medium sized venues with the confidence of knowing you won't need to mic the amp or connect the line out to the sound board. 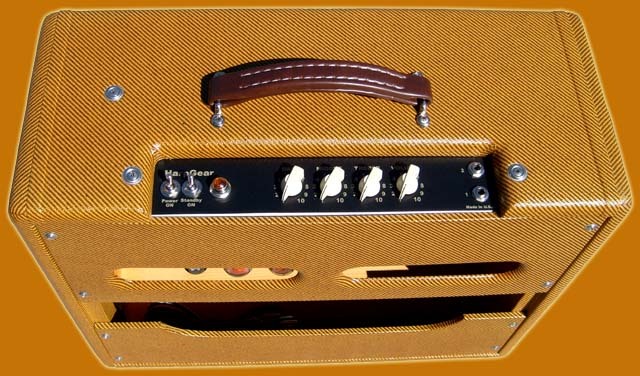 The standard HarpGear 35 uses two 10"Weber Red Custom made Alnico 30W 8ohm speakers built just for us with one 12AX7 and one 12AT7 preamp tube 2- 6L6 power tubes and 1-5AR4 rectifier tube. The amp has three adjustable tone controls being Bass, Middle and Treble. This amp has an oversized output transformer like the other amps and even more great bass to really accentuate those low notes while you're playing. The tube configuration for this amp is as follows:(1)5AR4 (2) 6L6 power tubes (1) 12AX7 (1) 12AX7WC preamp tube. This amp is 18"H X 22"W x 9.5"D and weighs 34#. This amp will generate 35 watts of power which comes across loud. 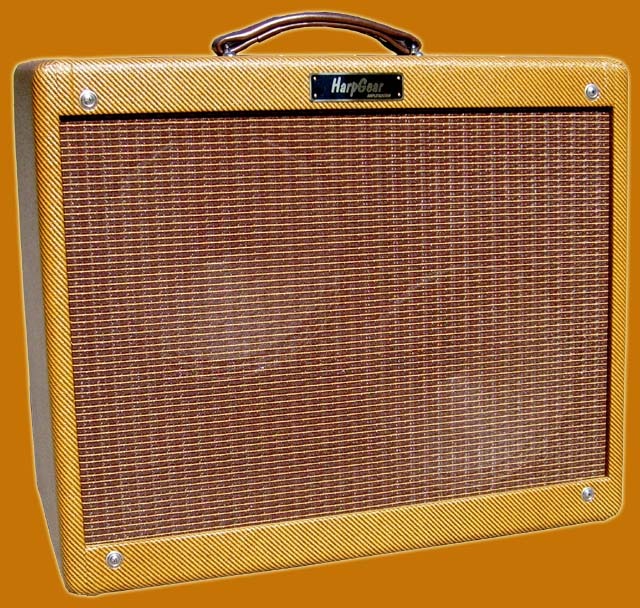 This amp is available in tweed or tolex and we can offer custom colors for tolex.